In the solar calendar of East Asian cultures, May 5 or “Lixia” marks the beginning of Summer. 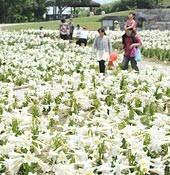 The season was ushered in with the blooming of 60,000 Easter lilies at Okinawa Comprehensive Athletic Park in Okinawa City. 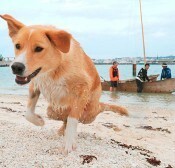 On May 5, the Okinawa Meteorological Observatory announced the beginning of the rainy season in Okinawa. It started four days earlier than average years and five days earlier than last year. Ballroom dance instructor and hobby-fisherman Minoru Higa has caught a 2.7-meter long moray. 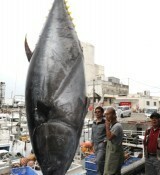 He said of the catch, “It was a hard work.” Before being pulled in, it struggled to escape, and swam back and forth for 50 meters along the dock. 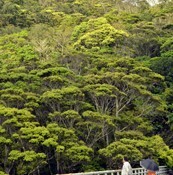 New green leaves have grown from the buds in the northern part of Okinawa, marking the beginning of spring. On March 16, a clear day, people visited Nagao bridge on Okuni forest road in Kunigani Village to view the new green leaves. 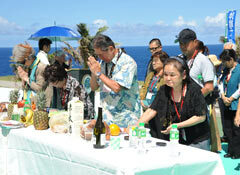 The third Sugar Ride Kumejima started at Ojima on March 16. 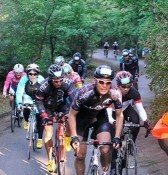 Cyclists enjoyed touring around Kumejima Town, which has rich nature.